I grew up in New York City, listening to punk rock and hip hop, spending most of my time at record stores and tattoo shops. It was as urban of an upbringing as you might imagine. With the exception of one or two trips a year “up to the country,” I rarely laid eyes on a farm. I didn’t know what a ranch was outside of a salad dressing choice. This was the 80s mind you, long before the advent of downtown farmers markets, farm-to-table restaurants and lumbersexuals — whatever that is. Urban and rural: never shall the two mix. Or so I thought. Thousands of cowboys can’t be wrong. Function…and form. Fast forward to today. I’ve been a guest here in the Rocky Mountains, in Colorado and Utah, for almost as many years as I was a resident of New York. While I will always claim to be a New Yorker, after fifteen years out west, and engaged to a girl who grew up on a farm, I am realizing a grey area exists. And I am it. To dip my toe in the proverbial water of embracing this paradox I wanted some cowboy boots. Not for a Halloween outfit or costume party; I wanted to rock those bad boys around downtown SLC. What other city (don’t even dare say Denver) fuses mountain west culture and urban life better than the 801? You’re still thinking Denver, aren’t you? Fine. Step One was to head up north to Smith & Edwards, an ACE Hardware store on our way to Idaho, close to where my fiance’s family lives. I didn’t tell her why I wanted to stop at this emporium of everything: guns, camo, groceries, bullets, sporting goods and rifles. Their motto sums up a theme you may have noticed: “City People Just Don’t Get It”. Fair enough. I had met the fine folks at Ariat Boots at last summer’s Outdoor Retailers show, and was quickly convinced this was the brand to bridge my urban past and present life into some boots. Ariat was founded by two women, Beth Cross and Pam Parker, who created western style boots for riding horses. Classic English and Western riding boots were built in less than comfortable ways, with little cushioning until Beth and Pam came along. 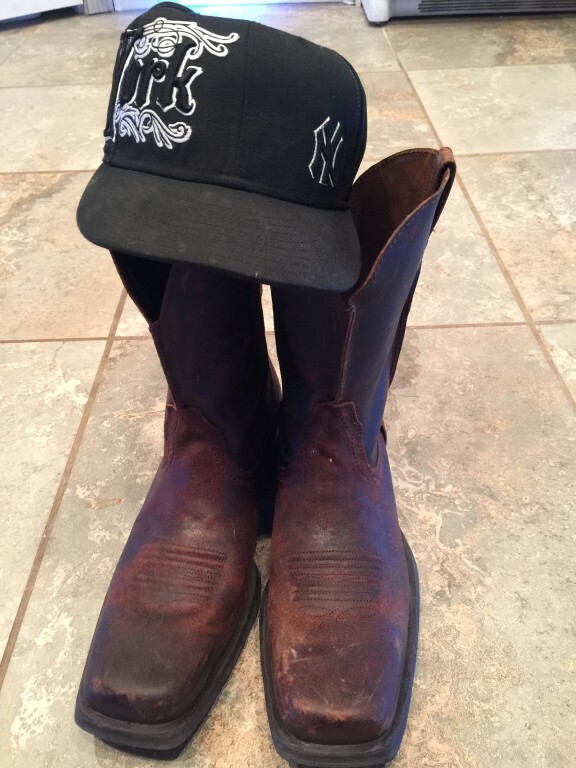 Since then, Ariat has been known for their comfort; something I wasn’t willing to compromise. 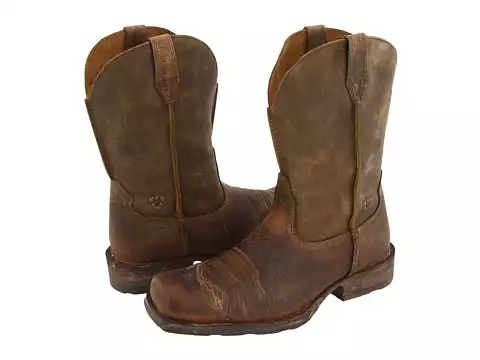 Anyway, I escape over to the cowboy boot section of Smith & Edwards, already knowing I wanted a pair of Ariat boots. The number of choices was maddening. Looking out of place, not just in the cowboy boot section, but in the entire store (I was wearing a Yankee hat and an Alta T-shirt with many visible tattoos), a nice salesman helped me pick out a pair. Whether he was playing a joke on me or not, remains to be seen. Proud of the pointy toes and heels on my feet, I saunter over to Laura. She breaks out laughing. Awesome. “Why are you wearing those”? Onto step two, which was to dig out the card one of the reps from Ariat gave me at OR. She was much more helpful in directing me to the right pair. Ultimately, I landed on the Rambler model. Featuring more a square toe, and a two-tone brown all leather upper, this model was slightly (exaggeration) more subtle than whichever model I had originally sampled. Being that cowboy boots do not have laces, it is imperative the fit is dialed. The leather stretches a bit, but not too much, so the width measurement is important. Same goes for the length, so your heel doesn’t slip up and out as you walk. The leather above your instep is all that is essentially holding you into the boot. Once I found this ideal size, the Ariat Rambler’s felt like slippers on my feet. A badass pair of slippers, mind you. Since then, I’ve worn my boots to work under dress slacks, with jeans to parties and plan to make them my official road trip and camping footwear choice this summer. They’re as versatile as they are comfortable. 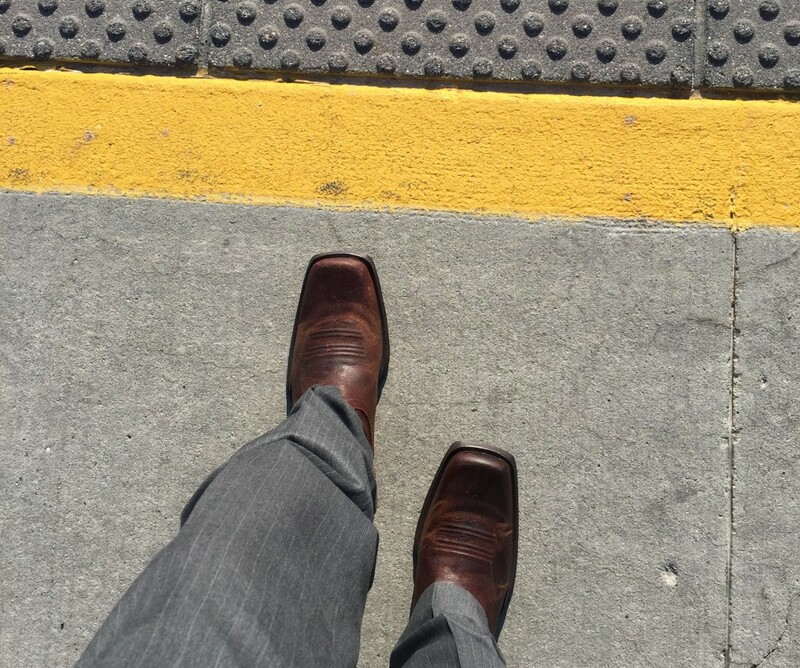 Boarding a downtown SLC TRAX train on my way to work in some new boots. First and foremost, much like basketball or skateboard shoes, styles are created for a purpose. I had to find the pair that matched my personality, not vice versa. Ariat has a wide variety of options within their line, some will look better on a real cowboy or horse rider than on I. Most people don’t notice things unless they look out of place, and guys with tattoos and shaved heads would look out of place on a horse or roping cattle or in boots designed for such. I’m not a fashion expert, but you get my point. Second, and most importantly, urban and metro DO mix. I am living proof of it, though I have one final test to conduct. I’ll be cheering on my beloved Yankees from their home stadium in the Bronx this summer. Guess what will be on my feet, protecting me from peanut shells and spilled beer? Cow. Boy. Boots. And if any Bleacher Creature steps on my toes, I’ll have more than solid foot protection. Thanks Ariat. Urban meets rural. Literally. Go Yankees! Rock on in the Cowboy Boots Nick! They are comfortable. But please remember… Anything over 5.4 at the local crag may be a challenge and require some elbow grease to get that leather happy again! No way, that’s how the old school climbers fit their foot into those off-width cracks! Thanks for reading!